Aged Skater Dave is dreaming of becoming the World Champion in Downhill Skating. At the beginning he has just his old surfboard with some plastic rolls which is hard to control. Falls seem to be unavoidable. 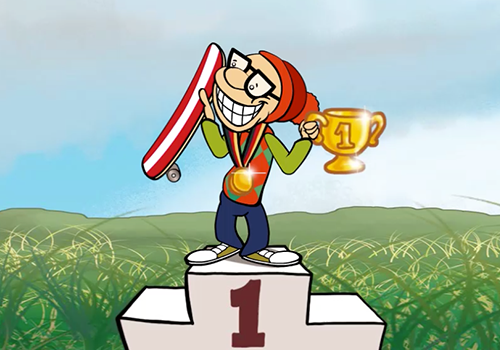 Nevertheless, to get the trophy he needs a lot of training and upgrades of his board. You jump into the role of Skater Dave. 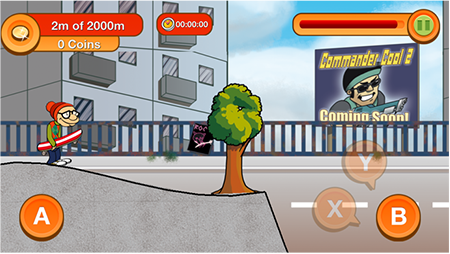 Upgrade the boards to jump higher, get faster and protect Dave from crashes With your motivation you will help him to manage to be successful. Have a lot of fun with Skater Dave and his humor! Buy Protection for Skater Dave to keep him save from crashes. You can skate longer and have more tries.